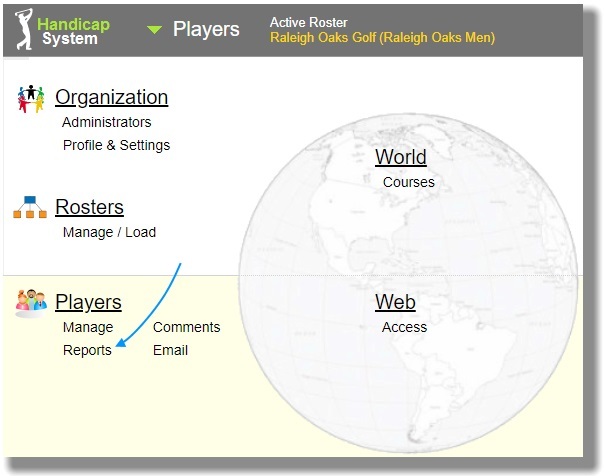 In Handicap System, activate the Options Menu by placing your pointer inside the area outlined below in orange. Click on "View Report" link for a report . Click on button labeled "Select players to include". Make your selections and click the Done button. typing in selection criteria (labeled "A." above) and then clicking on the "Done" button. Example above is "Tees = blue". You would have previously marked the Tees field in each players' information form. Only players marked "blue" for Tees will be included in the report. putting a check mark in the box labeled "Manually select players" (labeled "B." 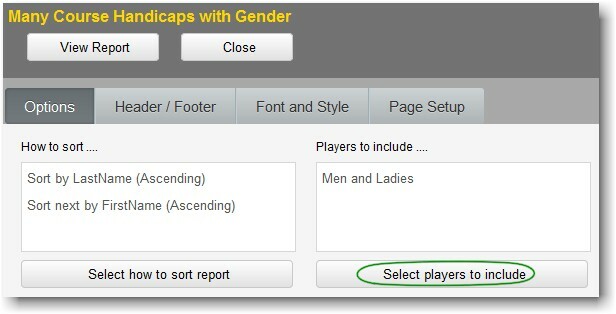 above) and then manually click on a player's selection box to put a check mark next to the player's ID number. You can click on one, some or all of the players. putting a check mark in the box labeled "Manually select players" (labeled "B." above) and then putting a check mark into the box at the top of the list (labeled "D." above) will mark all players for inclusion in the report. Taking the check mark out of the box at the top of the list (labeled "D." above) will remove all players from showing on the report. putting a check mark in the box labeled "Manually select players" (labeled "B." above) and then clicking on the button labeled "Match players using selection criteria above" (labeled "C." above) will mark all players that meet the selection criteria. Example above is "Tees = blue". You would have previously marked the Tees field in each players' information form. Only players marked "blue" for Tees will be included in the report. putting a check mark in the box labeled "Manually select players" (labeled "B." 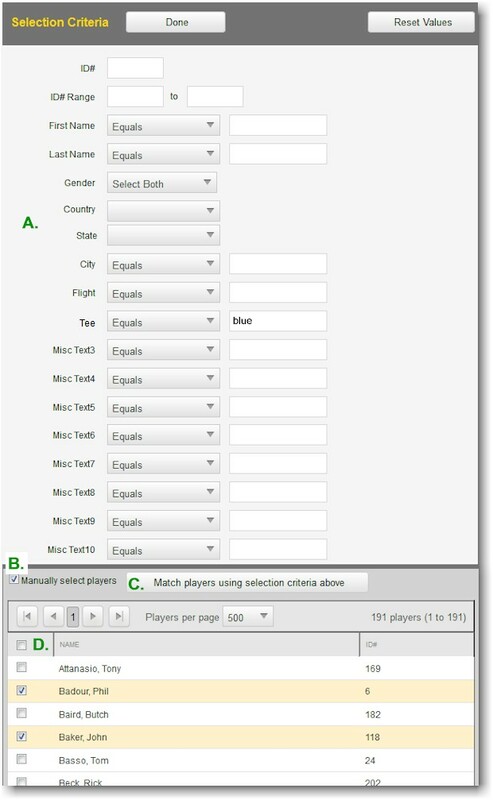 above) and then using the button labeled "Match players using selection criteria above" (labeled "C." above) AND clicking other players of your choice who do not match the criteria will select a custom group of players for your report. 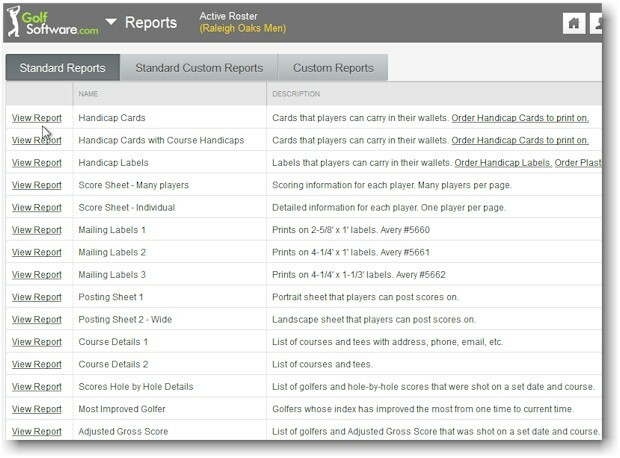 In the example above where the "blue" tees are selected, your report will include those players whose Tees field is marked "blue" and others who you have chosen to put a check mark into their selection box left of their ID#.